LAGOS JULY 16TH (URHOBOTODAY)-A 17 years old boy simply identified as Odo was reported to have burnt beyond recognition when fire guts “Madam Loveth Quarter” located opposite St John’s Clinic, Esenaebe Community, (Bomadi Overside) Bomadi, Delta State. An eye witness affirmed that they heard the cry of the young boy prior to his death and observed that he might have tried to escape from the raging inferno which occurred in the early hour of 3:47am on Thursday. 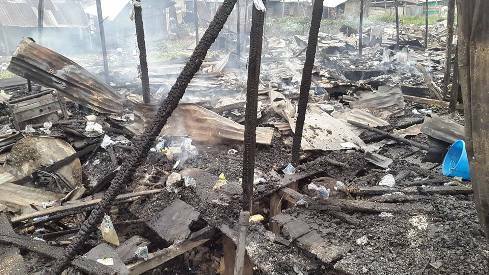 Urhobotoday learnt that properties including refrigerators, generators, Televisions and others worth million of Naira were destroyed by the inferno. As at the time of filing this report, the course of the fire outbreak could not be ascertain as a neighbor alleged that they suspected someone might have done the evil act and ran away, while another alleged that the decease might have lit a candle or coil (insecticide) and slept off. It was also gathered that similar cases of fire destruction had occurred severally in the past years in the Quarter built with planks.